As a part-time ER nurse at Memorial Medical Center in Ashland, Wis., Haley Stellmacher has already impacted plenty of lives. 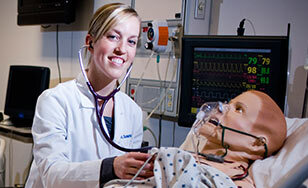 But now as a student in St. Scholastica's doctor of nursing practice (DNP) program, she's taking it up a notch. She's saving them. For her capstone project, Stellmacher is working on a new stroke care initiative that could lead to faster treatment and improved patient outcomes for people in her community. And though this project didn't come to fruition until her final year in the program, this desire to continue to help her community while attending school led her to CSS in the first place. "I started researching schools that would allow me to work but still have a connection with the school and the classmates and the professors," Stellmacher said. "When I started researching St. Scholastica, it seemed to fit everything I needed to be a successful graduate student. It also had a really good reputation in this area." St. Scholastica's DNP program is Northeastern Minnesota's only advanced practice nursing program — a "hybrid" program that's conducted largely online, with occasional in-person meetings. It includes specialized training for healthcare professionals to work in underserved rural areas. For her capstone project Stellmacher wanted to do something that would make a lasting impact on the rural area she calls home. The Ashland region has a Native American population of 11 percent, and this group faces a high incidence of strokes — making stroke care a major priority for the community. Stroke care guidelines recommend that patients go from the hospital door to a CT scan in less than 25 minutes. Time is of the essence: If a stroke is correctly diagnosed quickly enough, a "clot-busting" medication can be administered right away. So Stellmacher and fellow DNP student Melissa Malmberg set out to improve awareness about stroke symptoms with the goal of speeding up diagnosis and treatment. Currently, Stellmacher is working with Duluth healthcare providers on the initial project setup. Her focus is to educate and emphasize to paramedics, nurses, medical staff, and the community at large the signs of a stroke: a noticeable droop in one side of a person's face, weakness on one side of the body, and slurred speech. The project also has a high-tech component that brings the resources of larger hospitals to the Chequamegon Bay area. Thanks to a $30,000 rural telemedicine grant that Stellmacher helped to write, Memorial Medical Center is ordering a "stroke cart" with a monitor and medical equipment that will allow Ashland physicians to conduct live consultations with Duluth specialists 24/7. And St. Scholastica has been with her every step of the way, helping to make her goals a reality. "My education has impacted me more than I ever anticipated," she said. "My courses have taught me not only how to make organizational changes for the better, but how to lead them."